Starting a lawn from seed is the least expensive way to transform your home or garden with a new lawn. Find information and step-by-step instructions on how to turn grass seed into a lush, beautiful lawn. The best time to start lawns from seed, or by any means, is just prior to the grass’s season of most vigorous growth. First, you need to determine the type of grass that grows best in your climate — whether you need cool-season or warm-season grass. Think of cool-season and warm-season grasses as the yin and yang of the turf world. Or better yet, when you think of cool season grasses, envision blue spruce. When you think of warm-season grasses, envision palm trees. Get the picture? For cool-season grasses (which grow best in fall, spring, and, in some areas, winter), the best time to plant is late summer to early fall. At that time of year, the ground is still warm enough for quick germination, and the young grass plants have the entire upcoming cool season to become established. Early spring is the second-best time to start a cool-season lawn from seed. The young grass has less time to become established before the onset of hot weather, but results are usually satisfactory as long as you start seeding early enough. Warm-season grasses are best planted in late spring. At that time, the weather is still mild enough to let you get the grass established, but the hot weather of summer and the most vigorous growth are just around the corner. The soil is ready, the site is level, and the watering system is in place — now you can plant the seed. Make sure that you properly set your spreader rate for sowing seed. (You can check the manufacturer’s instructions, but many times, the spreader has the necessary information printed on it.) Put half the grass seed in the spreader. Spread the first half of the seed by walking in one direction and then spread the second half crisscross to the first direction. This pattern ensures even coverage. Don’t forget to use a starter fertilizer. Starter fertilizers are high in the nutrient phosphorous, which is essential to seedlings. Top-dress the seed to hold moisture. Open the door of a peat spreader (or cage roller) and fill it with peat moss or other fine-textured organic matter. You may end up spilling some, so don’t do this on the lawn surface; otherwise, you have to clean up the mess, disturbing the seedbed as you do. Briskly push the cage roller back and forth over the lawn until you cover the entire area. Apply a very thin layer, 1/8- to 1/4-inch of mulch, no more. Adjust your speed until the roller applies about the right amount. If you live in a windy area where the peat moss blows around or if you’re trying to save a dime, you can lightly rake the seedbed instead of mulching. Use a stiff metal rake and just lightly push and pull the tines back and forth to make shallow grooves and cover the seed. Don’t push too hard, or you’ll move the seed around or cover it too deeply. 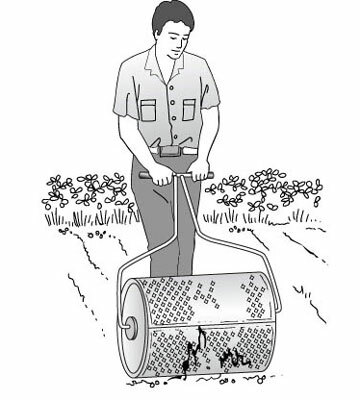 To ensure good contact between seed and soil, roll the entire area with a roller that you’ve filled only halfway with water. Roll the perimeter first and then finish the entire area. This may be the most important step. With the first watering, make sure that you apply enough water to wet the soil down to at least 6 to 8 inches. Apply the water gently so that you don’t wash the seed away or create puddles. You may have to water several times in short intervals until the bed is thoroughly wet. After that, water often enough to keep the top inch or so of the seedbed moist until the seed germinates. Remember, seeds get only one shot at germination. Let them dry out, and they’re dead. Sprinkle the seedbed lightly with a handheld hose several times a day — especially if it’s hot or windy — to get even germination across the entire lawn. However, you don’t want to overdo it. Too much water causes the seed to rot. Watch the color of the soil surface. As the soil dries, the surface becomes lighter in color. When you notice about half to two-thirds of the surface lightening up, it’s about time to water. Here comes the neighbor’s dog! Oh, no, what a muddy mess. To keep kids, pets, or whatever off your newly seeded, very wet lawn, encircle it with brightly colored string attached to small stakes. However, that may not be enough for the dog. If the lawn is small, you can surround the whole area with some roll-out metal fencing available at hardware stores — or at least tell the neighbor to keep her dog in her own yard. As your new lawn becomes established, you can start easing up on the water, depending on the weather. If you continue your everyday watering routine, you’re likely to overdo it and rot the young seedlings. Also, if the ground is too wet, you can inhibit root growth. If the grass doesn’t dry out, keep stretching the intervals between watering until you’re on a schedule of once or twice a week, or as needed. When you do water, don’t forget to water deeply, getting the moisture down 6 to 8 inches. Don’t be a light-sprinkling fool — you end up with one lousy lawn. But there’s more to a new lawn than just watering. You need to mow the new lawn when it reaches 3 to 4 inches high, depending on the type of grass. Mow when the soil is on the dry side; otherwise, you might tear up the new turf.